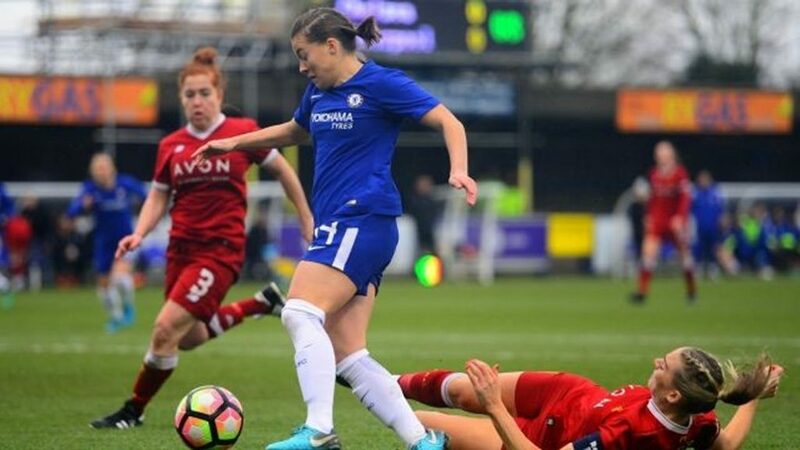 Arsenal, Chelsea and holders Manchester City made the Conti Cup semi-finals, although the latter only confirmed their progress past Bristol City in the dying minutes. Manchester City took an hour to break the deadlock at Bristol City, before making sure of the victory 3 minutes from time. The Vixens’ Chloe Arthur and Lauren Hemp combined to set up a chance for Yana Daniels but she could not quite direct her shot on target. From a Claire Emslie cross for Man City, Jill Scott got in a header which forced a fine save from Sophie Baggaley and within a couple of minutes, Scott also struck the woodwork. Demi Stokes fired just over the crossbar for the visitors as they went in goalless at half-time. The breakthrough came on the hour mark, as a deep cross by Abbie McManus was nodded home by Nikita Parris. Baggaley twice saved well from Emslie in a ten-minute spell, on the second occasion tipping a long-range shot over the crossbar. However, Man City got the second goal on 87 minutes, Jen Beattie with a header from an Issy Christiansen corner. Bristol nearly got a last-minute consolation but Beattie’s last-ditch tackle denied Hemp, who had got through on goal. 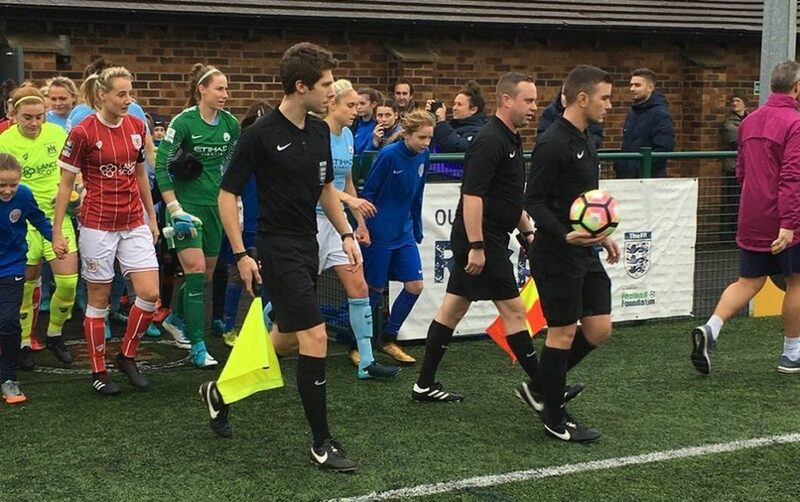 Emma Hayes’ side had all but sealed their semi-final berth after only 25 minutes, by which time they lead 3-0 with a Fran Kirby brace and a Ramona Bachman effort inbetween. 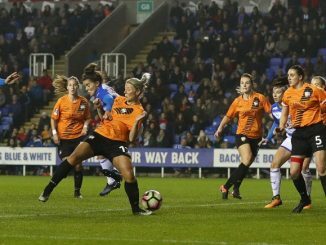 The Blues took only 3 minutes to open the scoring, Kirby sent through on goal and held off Gemma Bonner before slipping the ball past Siobhan Chamberlain. 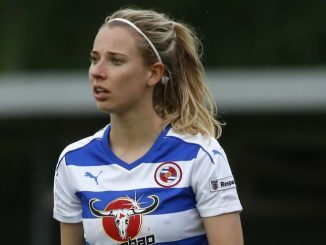 Bachmann was sent clear to round the keeper and slot home on 23 minutes and shortly after, Kirby got away to double her tally. Liverpool came close to pulling a goal back before the break, when Caroline Weir’s effort rebounded to Casey Stoney, whose strike was cleared off the line. Natasha Harding was denied at point blank range moments before Liverpool pulled a goal back, Stoney heading home from a corner 6 minutes into the second period. A Harding volley on the turn from outside the box was saved on the line by Carly Telford, just minutes before Kirby completed her treble on the follow up from Bachmann’s parried shot. An Ashley Hodson cross saw Alex Greenwood’s effort cleared off the line for the Reds but it was the Blues who found the net again, Erin Cuthbert coming off the bench to score. Weir was unlucky not to get on the scoresheet for Liverpool, her free-kick from distance striking the post and rolling across the goal. 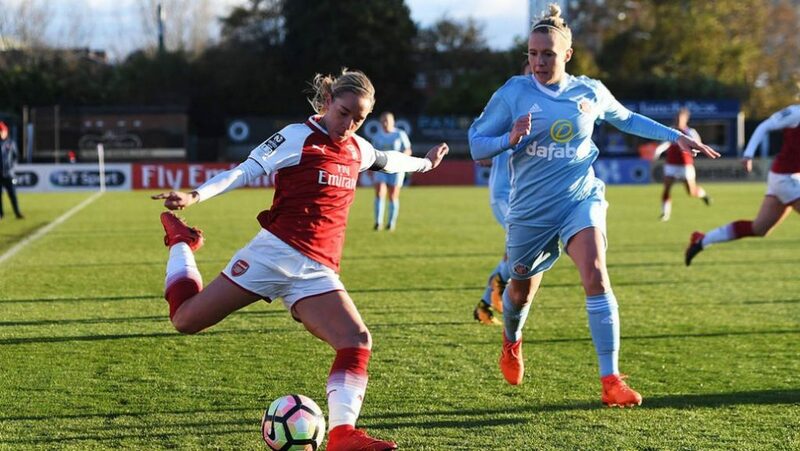 A second-half goal gave Sunderland hope away to Arsenal at 2-1 but former Black Cat Beth Mead got a conclusive third for the Gunners. Fourteen minutes in and Danielle Carter was denied by the bar after Vivianne Miedema wons the ball in the box but shortly afterwards Jordan Nobbs sidefooted home from a ball by Lisa Evans. The Gunners got a second goal 7 minutes short of the interval, when Miedema headed into the net from Carter’s cross. Simona Koren was kept out by Sari van Veenedaal, before on 56 minutes minutes Bridget Galloway slid in to beat the Dutch keeper and fire high in to the net. Carter hammered a shot off the post from a tight angle, with Arsenal scoring their third on 77 minutes, as misplaced pass allowed Mead to break and cut inside to net at the near post. 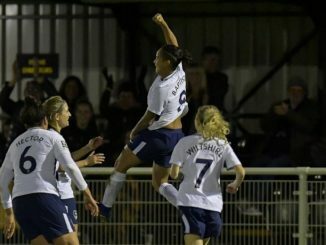 Rachel Laws turned a well struck Nobbs free-kick over the bar and then Evans headed a Heather O’Reilly delivery onto the post, as Arsenal went close to a fourth goal.